In electrical engineering, a hazardous location is defined as a place where concentrations of flammable gases, vapors, or dusts occur. Electrical equipment that must be installed in such locations is especially designed and tested to ensure it does not initiate an explosion, due to arcing contacts or high surface temperature of equipment. In an industrial plant such as a refinery or chemical process plant, handling of large quantities of flammable liquids and gases creates a risk of leaks. In some cases the gas, ignitable vapor or dust is present all the time or for long periods. Other areas would have a dangerous concentration of flammable substances only during process upsets, equipment deterioration between maintenance periods, or during an incident. Refineries and chemical plants are then divided into areas of risk of release of gas, vapor or dust known as divisions or zones. 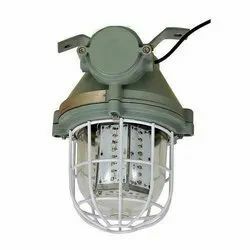 Flameproof Hooter is an industrial alarm hooter housed in a Flameproof Aluminium LM-6 Enclosure certified for use in Gas Group Areas I, II, IIA & IIB. It runs on 230 V.A.C. and finds use in Pharma , Bulk Drugs, Petrochemicals, Defence Industry. It can be coupled with Flameproof Controllers for Temperature, Pressure, pH, Vacuum, etc. Optionally available in 24 V.D.C. power supply version also. Ace Instruments manufacture a wide range of Flameproof Temperature Indicators that are suitable for Pharma, Bulk Drugs, Paints, Defence & Solvent Extraction industries, etc. 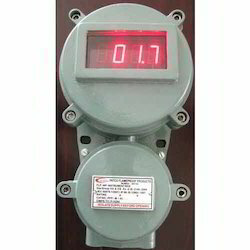 Flameproof temperature indicator is designed to monitor temperature in hazardous area applications. 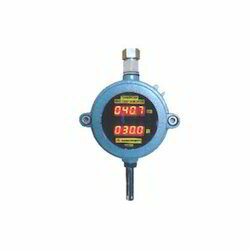 Flameproof temperature indicators with flameproof RTD PT-100 sensors as per customer design specifications of length & diameter with optional transmitters (4-20ma) are available as standard package. Display range is from -100. 0 to +400. 0 deg. C on 4 digit red led 7 segments 1" high displays with high intensity. Power Source 230 VAC, 50/60Hz. Flameproof RTD Pt-100 Sensors are Class A rated Resistance Flameproof Temperature Sensors suited for Flameproof & Hazardous Areas. The Flameproof RTD Pt-100 Sensors are Stainless Steel 316 MOC sensors with Class A accuracy along with an Aluminium LM-6 Flameproof Thermocouple Head suitable for use in Gas Group Areas I, II, IIA & IIB & are certified by CIMFR, Dhanbad. Customized lengths & diameter of pipe are available for all temperature applications. Measuring range of the Flameproof RTD Pt-100 Sensor is from -100 to 300 Deg.C & customized temperature measuring ranges are also available. Head Mounted Temperature transmitters are also available for 4-20mA, 2 wire current analog output. 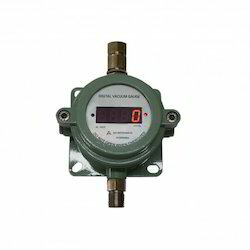 Flameproof Digital Vacuum Indicators manufactured by Ace Instruments are state of the art vacuum readout instruments with an in-built stainless steel diaphragm sensor & housed in an explosion proof/flameproof enclosure suitable for operation in hazardous areas. These instruments finds extensive applications in online continuous vacuum measurement at vacuum pumps, distillation columns, reactors, vacuum lines, furnaces , etc.in hazardous (Ex-proof ) areas with instruments housed in Flameproof enclosures certified by Central Institute of Mining & Fuel Research(CIMFR), Dhanbad, India, an authority with international approvals & processes . Sensors used are in-built imported Stainless Steel with S.S. 316 wetted parts & diaphragm with 1/2" BSP Male threading connection. 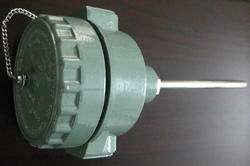 Can be measure both gauge vacuum in the range of 0 - 760 mm Hg, and absolute vacuum range of 760-0 Torr. 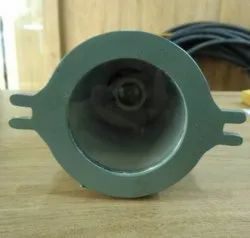 Indicators also come with imported external stainless steel transmitters with threaded end connection for installing onto the vacuum systems are also available in both the gauge, 0-760 mm Hg and absolute 760-0 Torr versions. On/Off and PID controllers for vacuum are also available with readout, optional dual display (PV and SV) and 4-20 mA retransmission output for connecting onto a PLC. 0 – 760 mm. Hg. /Speak to fac for other engineering units. Better than ± 0.5% F.S. ACE Instruments is one of the leading Flameproof Instruments Manufacturers and Suppliers in the worldwide market. Flameproof Switchgears offered by us are made from superior grade raw material ensuring high durability of the Switchgear. Further, clients can avail Flameproof Switchgears at industry leading prices from us. Looking for Flameproof Instruments ?